DK-LOK® Two Ferrule Tube Fittings are raising the bar! 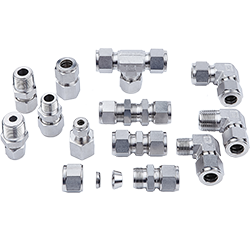 DK-LOK® Two Ferrule Tube Fittings incorporate the most ROBUST, FULL MASS back ferrule technology on the market. This back ferrule technology along with outstanding dimensional control allows DK-LOK® to perform leak free against ASTM F-1387 as a pure assembly and when intermixed with Swagelok®. Ask us about our ASTM F-1387 pure and Intermix testing. Simply Impressive!